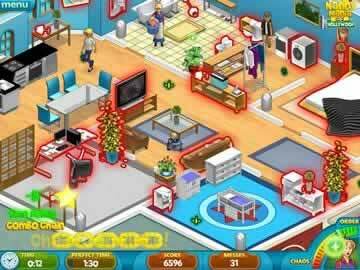 Nanny Mania 2: Goes to Hollywood Game - Download and Play Free Version! Help Nanny Emma Wrangle Rambunctious Rascals in Nanny Mania 2! Help Nanny Emma Save The Day Once Again! After successfully taking care of Mayor Whitby and his family, Emma heads off to California to relax on the sandy beaches. She soon finds her work cut out for her when she takes a job with Sophia Ashford, a grown-up child star and academy award winner who is incredibly wealthy and completely overwhelmed by raising a family. Help Emma to take care of the children and pets, do the laundry, fend off the paparazzi, and keep this lovely home from falling into chaos. Work to keep this house spotless with plenty of past-paced, quick-clicking action and tons of challenging levels. Nanny Mania 2 adds onto the fun and addictive time management gameplay of its predecessor. Your primary job is to keep the house clean by sending Nanny Emma to wherever a new mess crops up. As more and more messes appear on screen, you can chain the tasks, and earn a bonus in the process, by clicking on items in advance and Nanny Emma will attend to them in the order you clicked. Some tasks require multiple steps, such as doing the laundry involves gathering up the clothes, putting them in the washing machine, then into the drier, and finally away in one of the dresser sets. Additionally, some of the messes actually grow larger the longer you leave them, like leaking toilets and tubs can easily create puddles all over the floor. Nanny Mania 2 continues the series with solid gameplay mechanics and time management basics which any fan of the genre can enjoy. With a cartoon-like style and a family friendly story, Nanny Mania 2 is great for players of all ages. Expect to push your managing skills to the limit and even test your dexterity as you rapidly click away to keep this household from falling apart. The different houses and distinct layouts mean hours of fun and lots of replay value. Also, there are some special surprise features to keep the game interesting, such as keeping the windows closed when the twins are born to keep the paparazzi from snapping any unwanted pictures. 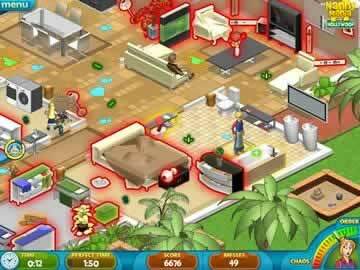 If you like time management games with fast-paced action, then download Nanny Mania 2 and start cleaning today! Catch a glimpse of the hectic gameplay you can enjoy with this title as you clean up after a prominent Hollywood couple. Make up the beds, clean rooms, do the laundry, and change diapers as you work to keep up with this household which is anything but tidy.